If you really wish to take someone’s breath away, this fabulous bouquet is the choice for you. 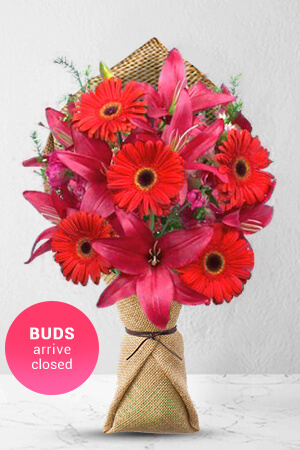 The striking red colour of the Gerberas and Lilies, will make anyone gasp with delight.Lilies may be sent closed/partially closed in order to prevent damage and to last longerThe vase in the picture is not included, however if you would like to make your flower gift extra special, add a vase to your order. We recommend you add a Premium Vase to your order to complement Breathless. super reliable delivery at short notice order. highly recommend. Beautiful flowers which were delivered on time. My mother in law is thrilled with them. Flowers sent are totally different from what was chosen off the site. Always easy and delivered in a timely fashion. Living apart has been difficult, but being able to send flowers to Japan from Canada has made it a bit easier.